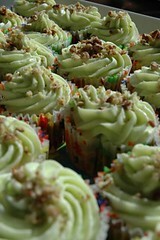 The first is a photo of tropical carrot cake cupcakes with cream cheese frosting and toasted pecans. The second is a lemon cupcake with lemon buttercream frosting. They were both wildly successful. The carrot is a Magnolia Bakery recipe with my own cream cheese frosting and the lemon is my own creation (the secret ingredient is wine).